Neat, attractive pitcher pump that can force water to any location. 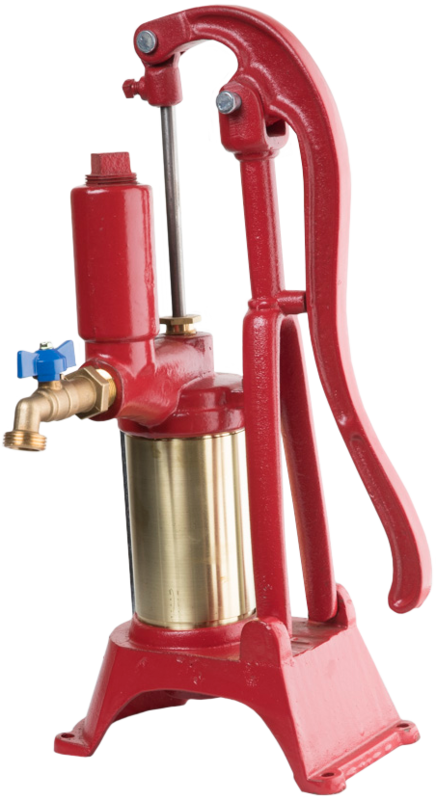 This pump is made of the highest grade gray iron castings. The brass cylinder is machined smooth and polished to reduce wear on leathers. Can I force water to a storage tank? You can, but it depends on the model of pump. We have several models (including models 50L and PHB Pitcher Pump) that can be used to force water to fill a storage tank. This can be done through either a garden hose or hard piped. Can I have both a hand pump and a submersible on the same well? Yes, but it depends on the well casing diameter (5” minimum) and the amount of room between the pitless adaptor and the inner well casing. How deep can I pull water from? With our pitcher pumps, water can be pulled from around 25ft. With our windmill pump and deep well pumps you can pull from up to 250ft. Static water level is the distance between the ground and the water level in the well casing. Example: The well may be drilled 150feet deep but the water comes up within 75ft of the ground in the casing. The static water level would be 75ft. Can I use a windmill? Yes, several of our pumps have windmill adaptors (including models 50L and 192A).